Your guide to the elections that will determine Egypt’s future. On the surface, it seems as if tomorrow's Egyptian elections will be a dreary formality. Although the official campaigning period for the Shura Council, Egypt’s upper house of parliament, has been going for two weeks, the streets of Cairo are noticeably silent. The only overt evidence of political gamesmanship is the paraphernalia of the ruling party’s candidates plastered in the city’s central squares. Campaigns here tend to be lackluster because they don't usually matter. President Hosni Mubarak and his ruling National Democratic Party have spent much of their last 30 years in power honing their ability to rig votes, suppress political opposition, and silence critics of the regime. As Egypt kicks off three rounds of elections in the next 16 months—two parliamentary (June and November 2010) and one presidential (September 2011)—it is logical to assume that they won't matter a whit. But this time, they will. Egypt is on the cusp of change. The status quo is unsustainable because President Mubarak, who turned 82 two weeks ago, can’t hang on forever. Having declared in 2004 that he would rule “until the last breath in my lungs and the last beat of my heart,” Mubarak recently underwent gall bladder surgery in Germany and returned looking frailer than ever. When Mubarak's death arrives, all bets as to the future organization of Egypt's power structure will be off. Most likely, there will be a carefully managed transition of authority into the hands of Gamal Mubarak, the president's son. But, no matter how smoothly that handover proceeds, once Mubarak the elder dies, Egyptian politics will be fundamentally altered. “When we have a transfer of power, power gets reshuffled and redistributes and usually that’s pretty good for opposition movements to make some gains,” says Joshua Stacher, professor of political science at Kent State University in Kentucky. Tomorrow's elections—and those that follow—will determine which of Egypt's important power brokers have the upper hand in that struggle. The NDP doesn't necessarily have its act together, however. While the going assumption is that Gamal Mubarak will succeed his father, there have been some hints that the elite is disorganized and has not coalesced around a specific successor. Nine days ago, for example, Prime Minister Nazif told the local press that he'd urged Hosni Mubarak to run for another term in September 2011, saying, “The system has not put forth an alternative [to Mubarak], who can be comfortably placed in this field.” Meanwhile, Safwat El Sherif, secretary general of the NDP and speaker of the Shura Council, told Al Arabiya television in Dubai that, "[Mubarak] is a legend who cannot be replaced." And division between party elites never bodes well for an NDP-style organization as a whole: If the ruling party struggles to present a united front around a successor, space will open up in which the domestic opposition can advance. Almost certainly, a new president will mean new rules of the political game. “At least initially," explains Stacher, "the trajectory of almost any president in the Middle East that comes to power, you sort of back off and let them (the opposition) play a little bit and then you crack down on them when they start making gains." The armed forces are another major player in Egyptian politics. Although they do not appear to manage day-to-day domestic affairs in Egypt, every president since Gamal Abdel Nasser has been a military man, and they are arguably the most powerful force in the country. Thus, it's relevant that Gamal Mubarak is not a military man. Who would they prefer? It's not clear, although general Omar Suleiman, Egypt's intelligence chief handles the Israel-Palestine portfolio and has been rumored to be a potential successor to Mubarak. But the generals will not intervene publicly in the election. As they usually do, they will remain out of the limelight unless it’s absolutely necessary for the military to step in to maintain the regime’s hold on power. “The Egyptian military are interested in the political stability of the country. So long as president Mubarak’s regime can manage to administer these elections without much trouble, I doubt the military will do anything to disrupt this process or to change the power structure in the country,” says Mustapha Kamel El Sayed, political science professor at the American University in Cairo. Waiting in the wings is the Muslim Brotherhood, Egypt’s largest opposition group. Despite being officially banned in 1954, the Brotherhood has maintained a strong social and political grassroots presence. Running as independents, Brotherhood candidates attained 20 percent of the seats in the People’s Assembly elections in 2005. But the group walks a fine line to stay alive—frequently critical of the government, it makes sure not to pose too much of a threat. Running in select districts, the Brotherhood has never nominated enough candidates to win a majority of seats in parliament, mostly because they know the regime would never stand for it if they did. No one anticipates a major political power-play by the Brothers in the next 16 months, but the coming elections will determine the group's willingness and ability to keep participating in government. “The electoral strategy in the upcoming elections will be: Minimize the participation to avoid provoking the regime. The main goal will not be to have huge representation, [but] rather to maintain the continuity of being on the political scene,” says Khalil Al Anani, a senior scholar at the Institute for Middle Eastern and Islamic studies in Durham, England. Indeed, as the country heads toward succession, the Brotherhood will likely “hold tight and wait until better days come,” says Stacher. In the long run, if the regime weakens or if the country democratizes, the popular Islamist party will have a shot at greater political influence. The regime isn’t only concerned with suppressing the Muslim Brotherhood. Egypt's domestic opposition is a motley crew of 24 official political parties and anti-government civil society groups—most of which don’t actually get along with each other. The political parties are largely ineffective, and many are seen as co-opted by the regime, while the activist groups suffer from political infighting and have never had much success in mobilizing the masses. Nevertheless, things have recently taken a turn. That's because of Mohammad ElBaradei, the former head of the International Atomic Energy Agency, who returned from Vienna to Egypt in February 2009, declared that he would consider running for the presidency if the country held free and fair elections. This event galvanized the opposition, which has rallied around ElBardei’s National Coalition for Change—a grassroots petition group that is attempting to collect enough signatures to revise the constitutional amendments passed in 2005 and 2007, which make it impossible for an independent candidate to run for president. At this point, ElBaradei's commitment to running for office seems to be largely rhetorical—a symbolic attempt to highlight the flaws of the Egyptian political system. He knows any attempt to work within the regime’s system and join a political party will backfire. “The regime has rigged the rules of the game so that if anyone participates in the game on their rules, they are bound to lose, but the regime wins not only the outcome of the game but the semblance of there being a game to begin with,” says Shehata. 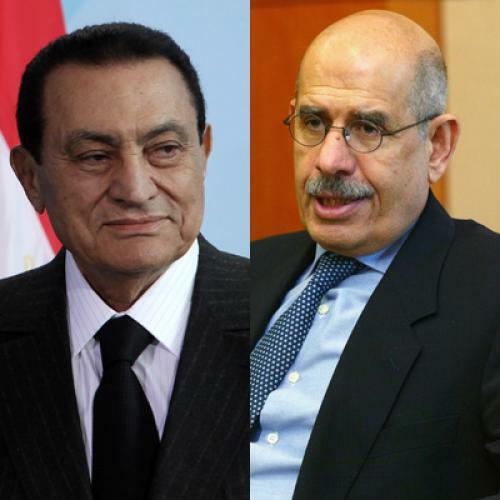 Nevertheless, most of the major opposition players have joined ElBaradei’s coalition, including the Muslim Brotherhood and opposition politician Ayman Nour’s party El Ghad. (Nour was the independent opposition’s darling during the 2005 election. Coming in a distant second to Mubarak was enough to get him thrown in jail on bogus charges.) While it remains doubtful the aforementioned opposition groups are seriously committed to power-sharing in the long run, they also know they stand a better chance of altering the constitution if they are united. If the groups are able to present a united front and mobilize the disaffected masses, the regime’s stranglehold on power will be lessened. Riding on the momentum of ElBaradei’s return, the next 16 months present an opportune time for the opposition to finally get it together. If the opposition somehow manages to close ranks, remain unified, and tap into widespread public frustration with the Mubarak regime, it will strengthen their hand for future dealings with the government. That could provide them with enough clout to put pressure on whoever succeeds Mubarak, and earn them a seat at the table in the new Egypt. “The kind of dynamism we see now in the Egyptian political system is bound to produce important effects, not necessarily in the short term, but I think in about three or four year’s time,” says professor Mustapha Kamel El Sayed, a political science professor at American University in Cairo (of AUC), who sees the potential for constitutional change in the future and a new political reality for the 2017 presidential election. And, because Egypt is on this trajectory, commentators agree it is not in America’s interest to stand idly by. It's clear that Washington’s rhetorical commitment to advancing democracy in the Arab world has taken a backseat to our interest in political stability, but as Egypt changes, this approach may no longer be sustainable. According to Michele Dunne, a senior associate at the Carnegie Endowment for International Peace, the United States should be worried that, as Mubarak's regime gets less and less popular, its ability to defend U.S. interests in the Middle East will wane as well. “What the U.S. should be interested in is a gradual, but deliberate process of democratization in Egypt," she explains. "[An] increasing gap between the regime and the citizens, increasing dissatisfaction and decreasing legitimacy for the regime, decreases [the] ability for the Egyptian regime to play a positive role in the region. All of that is not in the U.S. interest either.” Indeed, allowing for space for political pluralism may be just as beneficial to the people of the United States as it is to the people of Egypt's.